I'm going to be taking a little break from sewing. I live in a very quirky little old house (at one time it was the post office of Riggsville, Maine) which desperately needs my attention. 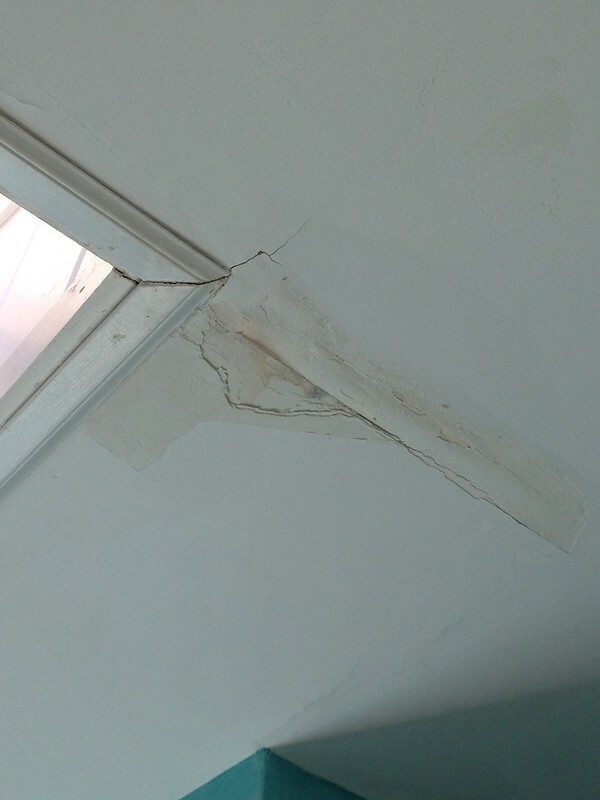 Water damage around a leaking skylight in the bathroom. 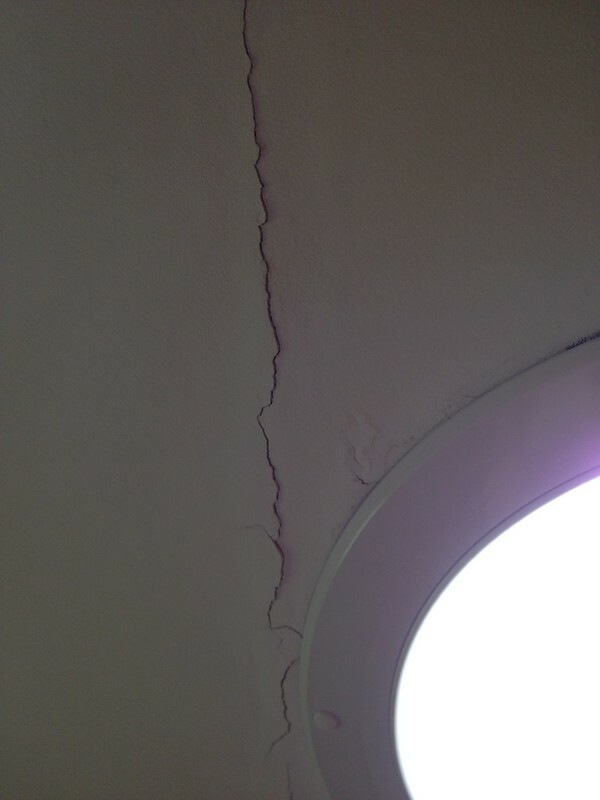 A big crack around another skylight in the pantry. A section of bannister that needs to be built before I fall down the stairs and break my neck. I look forward to getting back to basics when I return (working exclusively from my stash). 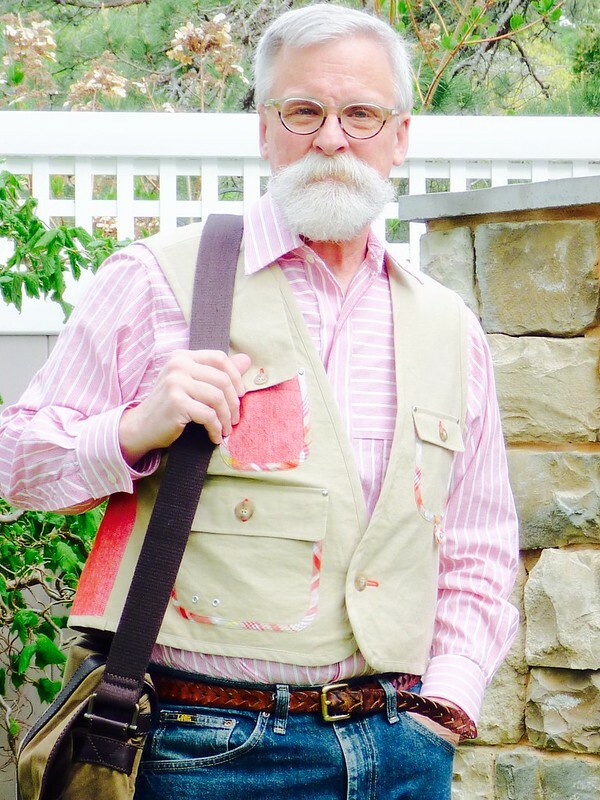 Definitely on my list of "to be sewn" ..... A pair of linen shorts, a pair of khaki shorts, a pair of khaki Jeds, and a plaid shirt. That's certainly enough to keep me busy till Fall. Wishing you all happy sewing. (I'm already in withdrawals!). 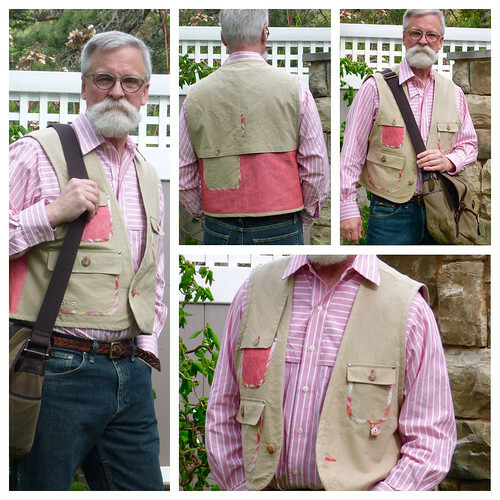 The Watanabe inspired "fishing vest" has been finished for awhile, but I've not had much interest in either photographing it or blogging about it. Basically, I'm just not all that thrilled with the result; something that rarely happens to me. As much fun as I had drafting my own simple pattern and adding all kinds of " bells and whistles" to it; in the end I took the whole concept too far for my own good. 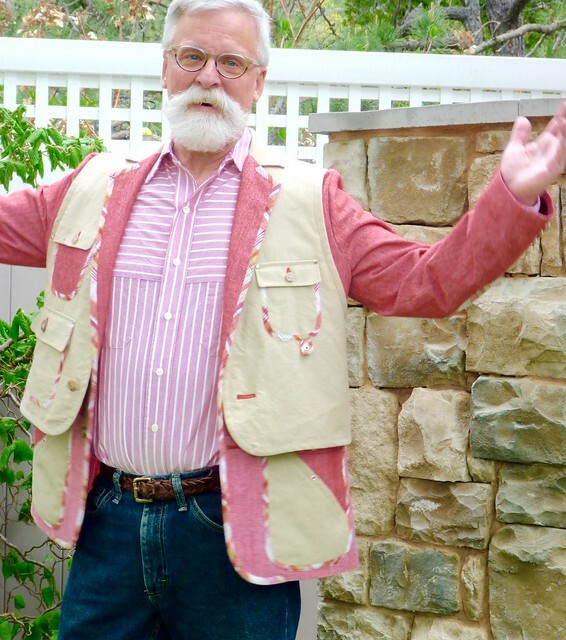 It's just a little too crazy for me, especially when I team the vest and jacket together. It makes me feel way too conspicuous, and that's not a feeling I enjoy. Maybe if I lived in a more urban environment I could pull it off, but here in coastal Maine it's just not working for me. 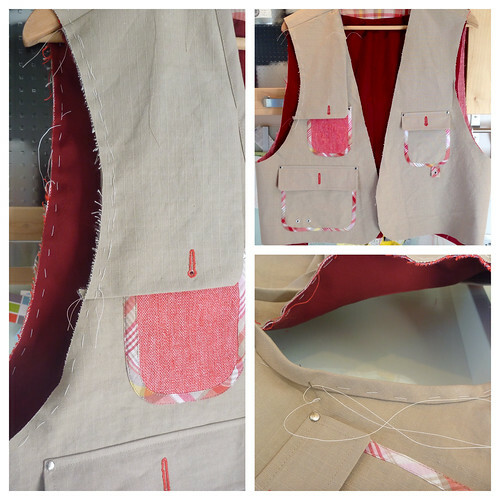 The vest is lined with bemberg rayon, and the edges are finished off with bias trim. The shirt I made for Christmas a few years ago. 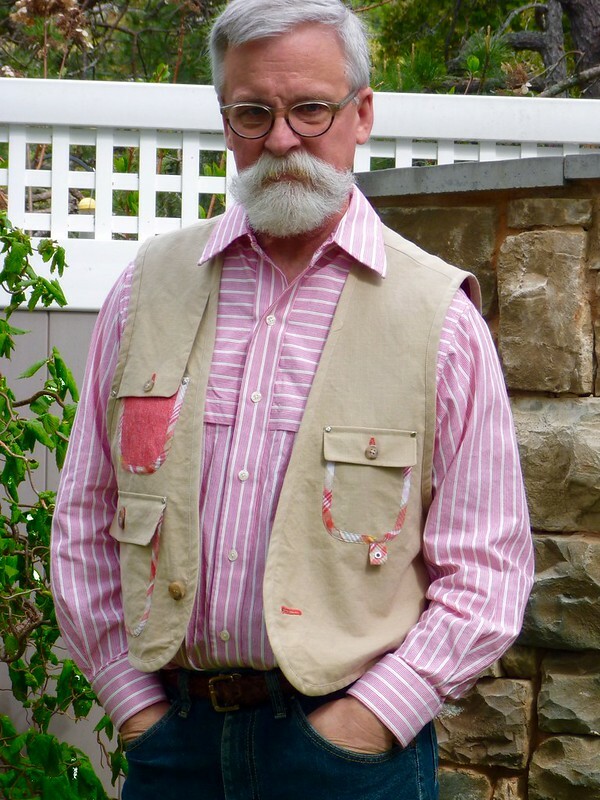 It goes well with the vest, and I actually like this look. 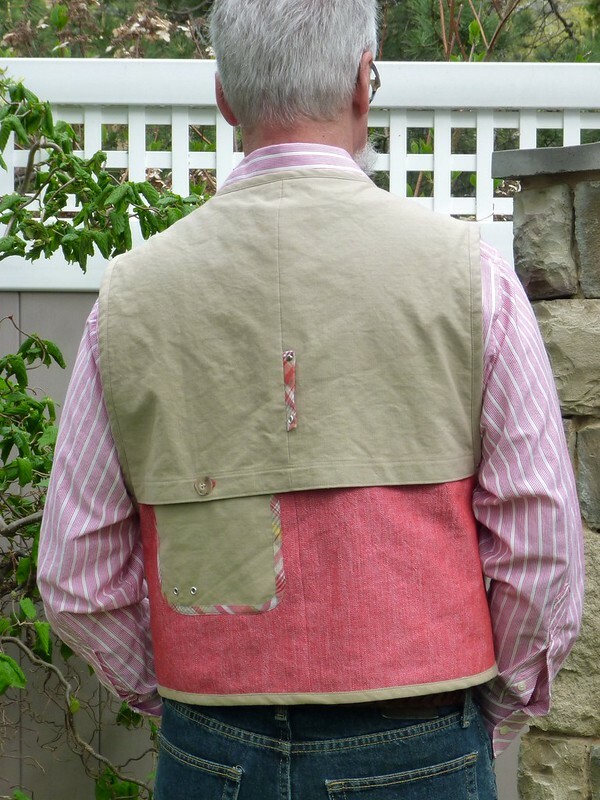 The back of the vest has a large storm flap which buttons over a largely useless pocket. Grommets and rivets abound. At the time it was fun. Now I just have second thoughts about it (almost all of it!). Am I headed down the rabbit hole? I'm still in "wearable" territory, but teetering on the edge. Get ready to go over the cliff! Here's where it really starts to unravel for me. 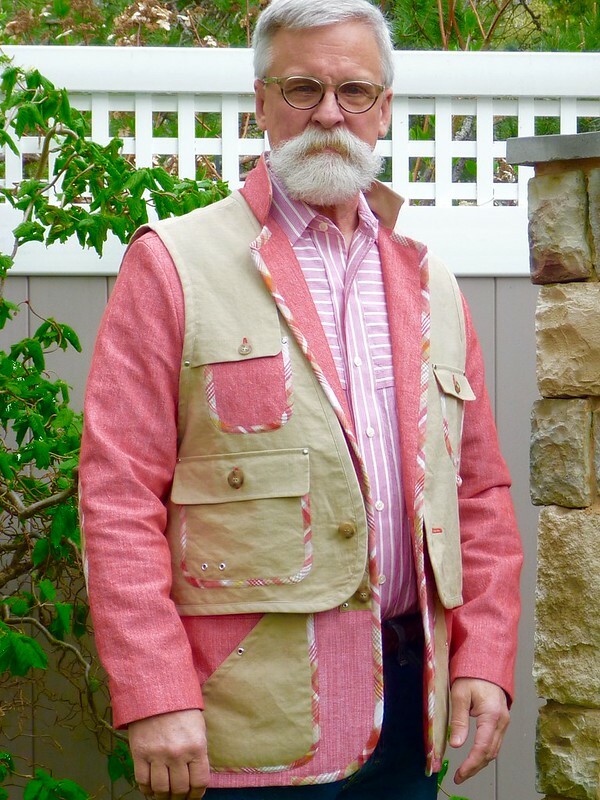 I liked the vest over jacket concept by Engineered Garments, but there's just too much going on here. Maybe it needs a solid color to work...or a younger and braver man! Sadly, I just can't feel comfortable wearing the two pieces together. 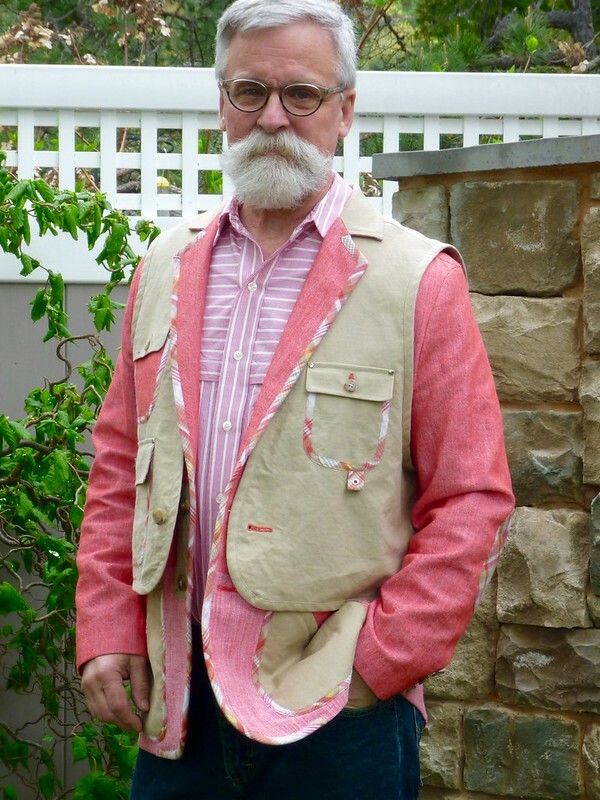 The jacket I like. 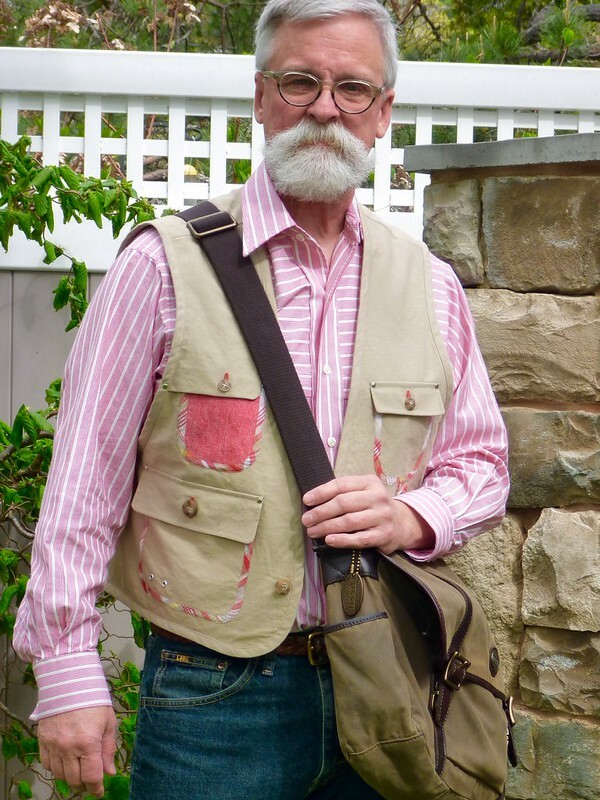 I'm luke warm to the vest. The combination is completely unsettling, so totally "not me". I just can't bring myself to wear it, so these photos may be the only time this garment is ever seen. Can I photoshop my way to liking this look? Has this ever happened to you? 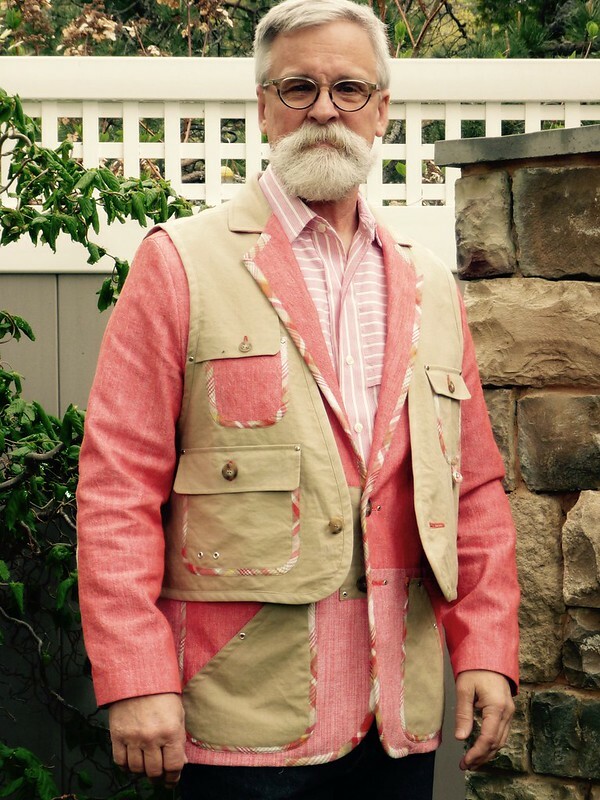 Where is the line between stylish and clownish? In the end it's all about the journey. You win some, you lose some. My joy is in the process, the making, the sharing, the learning. I'll be interested in seeing people's response to this. Surely I'm not the only one who's ended up at this point. 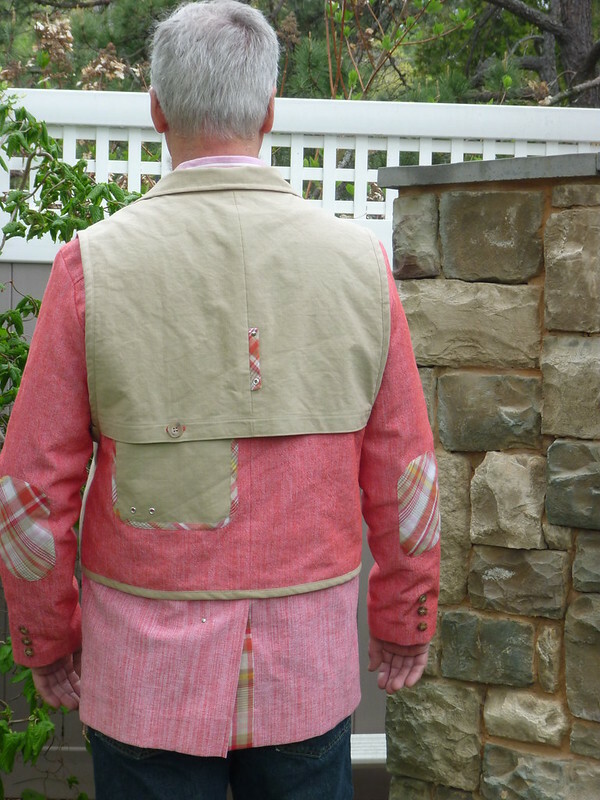 From good intentions, to the excitement of creating the physical garment..... only to end up on "unwearable street". Have you been there? Spill.